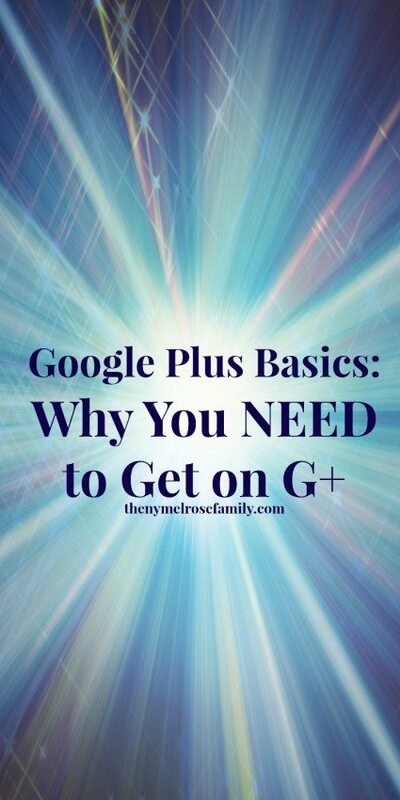 This is the second installment within the Google Plus Basics Series and if you’re questioning the importance of Google Plus then you’re going to want to stick around. Last week we talked about Maximizing Your Profile and I showed you through a video tutorial some tips that are beneficial whether you’re a regular plusser or just starting out on G+. Today we’re going to talk about Why you, as a blogger or business owner, need to get on G+. You can find the video here. You can’t simply come over to Google+ with your friends and just +1, comment and share each other posts. That’s not going to bring you authentic interaction. In the beginning you’ll see growth in your following, but isn’t the point of social media to gain an audience. I’m not just talking about an audience that’s going to click over and read your first sentence or just pin an image. I’m talking about an audience that authentically reads your content and comes back looking for more. They dive into your content looking for the next best thing. That’s the audience that I try to cultivate because Googe Plus provides that opportunity. Expand Your Audience. Did you know that Google Plus is searchable? No. Not just by Google. By you!! You can enter any keyword you want and find like minded people, which means that they can also find you. So, if I enter cookies into the search within Google Plus it will pull any post where cookies have been written about. I now have an entirely new group of people that I can add to my baker circle if I like their content. Search Your World. Once someone is entered into your circles, their article will be brought to the top of your search. So if I now search Google for birthday cake ideas. The people that I added into my baker circle from my cookie search before are now part of the pool of people whose articles will come up first if they have written about birthday cake ideas. Google knows that you already like what they do so they’re making it easier for you to find articles that will resonate with you. The IMPACT as a blogger. Google Plus is a platform that drives authentic interaction between you and your readers. We are given the opportunity to come out from behind our words and share through visual images and authentic interaction who we really are. My audience doesn’t read my blog because it’s The NY Melrose Family. They read it because of my voice. I am my blog and the content that comes out of it. Therefore, I want to promote my articles through social media on a platform that allows me the opportunity to show who I truly am. Once I have that interaction on Google Plus, I am now entered into a circle that isn’t just part of a statistic. I’m now in a circle of people whose articles will come up higher in search for those who have circled me. Google is trying to provide us with a way to swim through all the spam and distractions and get to what we are truly looking for. Let’s be honest, in a digital age where there is something constantly trying to get our attention, who has the time to wade through what is relevant to our search? Google is doing that for us and I’m going to help by getting on Google Plus and gaining a new audience! Thanks for this helpful article. I am pretty new to google+ and feel like I am just muddling around in it! I understand. It’s an amazing platform if you give it a chance. Check out my social media tips that I’ve already created and be sure to follow along in this series. If you subscribe to my youtube channel, you’ll be sure to be notified every time there’s a new video. Hi Jenny, thanks again for a great G+ tutorial. I’ve never done a keyword search on G+ but this tip is certainly going to help me organize my circles (which I desperately need to do). Question: any plans on doing a post regarding the Pros and Cons of G+ Comments on our blogs? I sure could use some tips in that regard! Maria, You must be on blogger. I’m on WP and have been long before the G+ comments were infiltrated so I don’t have any direct experience with it. My thought would be that the more comments the better though and if they’re going through Google I would think they could only help you. It shows interaction and that you as an author are authentic. Thank you Dee for following along and providing feedback. Hugs! It’s crazy…I’ve been using G+ for awhile now doing +1’s here and there, but I’ve just recently starting playing around with it more. Thanks for the post! Two questions: One. How do you know your google authorship is set up? Two. What are the pixel dimensions of the cover photo? Lisa, If you google “rich snippet testing tool” it’ll walk you through finding out whether you have authorship established. My video next week is actually about authorship and screen shares how to share it. My maximizing your profile from last week has the dimensions of the profile pic in it https://thenymelrosefamily.com/2014/01/google-plus-basics-maximizing-profile.html as well as some other tips for perfecting a profile. HI there! Found you on G+ – so there you have it! :). I would love your take on expanding your circles without being spammy or spending eons of time. I am trying to grow but it’s happening slowly. I need to get my cover image to have my blog info on it and them move from there. And I would love your take on profile vs page – I see you have a decent following on both. Thanks so much in advance! I am newly subscribed. Do you know how to change the names of the circles you’ve created? Mireya, If you go to People on the left and then go over to Your Circles in the middle, it will bring up all of your circles with the number of people in them. If you hover over a particular circle an option to edit and delete will come up. Use the edit to change the name of the circle. Thanks so much! Going back to read part 1. G+ is something I haven’t been able to wrap my mind around yet. This is a start Trish. Stick with me and I’ll walk you through it. Make sure to subscribe to my YouTube because the upcoming videos are going to hold your hand through it. I’ve been using Google + for a while and been doing much as you said in the first paragraph, because I don’t “get it”. Now that I have read your post I’m going to try the search and circle ideas! Lets hope it makes all the difference! Thanks for the post! The next upcoming videos will help you a great deal Domestic Goddesque because I’m going to show you how to post, share others’ content and how to search for that new audience. Be sure to subscribe to my YouTube Channel so that you’ll have access to the video right away. I am so glad that this resonated with you Deb. I love the way you described it as being part of a “whole”. That’s absolutely it! Christine, The next upcoming videos will be super helpful to you because I’m going to walk you through how to find that new audience. Make sure to subscribe to my YouTube to be notified when it’s released. Great post, Jenny! My first time here, but I can see I will be back…:-) I am still new to Google+, but I love it so far. I find that it is much easier to connect with like-minded folks there. The give and take also seems better than on some of the other social platforms. I think if you have time for just one platform, Google+ would be a super choice. It’s absolutely my platform of choice Rika. The interaction is what brings me back because it’s a community feel to it. It’s not just people aimlessly promoting themselves. Hi Jenny…your videos are amazing…I think I have watched them all at least 4x now. We are trying to get a grip on this Google + thing. Unfortunately, we initially set up a Google + page under our blog name (I guess as a personal profile). We’ve been gradually adding posts there but now I understand why this isn’t correct. We are confused though. 3 of us author our blog. I saw in your videos about establishing authorship and the Google plug-in for multiple authors. BUT…does this mean that if we ever post as our blog, we do so under EACH of our personal profiles as the blog????? I’m sorry if I am missing something. I just want to do it correctly. Thanks! You want to each create a personal profile in your real name. The purpose of authorship is so that google can compile all of your articles across the web. So lets say one of you writes on article spoonful, google will give the credit to the one of you that wrote it. You all have a huge advantage because now you can grow your audience by 3. I’m honestly hugely jealous. Lol. The amount of Google +1’s that you have also impacts your site ranking in searches. Having more +1’s on your posts will make your blog appear higher in search results. That isn’t necessarily true or proven Mike. I would be careful about putting that out there. To clarify, the more authentic interaction that is seen is what helps with your SEO or appearing higher in search results. A post that gets 100 +1’s, but only 5 shares compared to a post that gets 40 +1’s and 25 shares isn’t going to rank better. It’s all about the authentic interactions. I just learned so much by this video and article! Thank you so much, I was going about it all wrong when I’m on google plus! I love sharing articles, but I need to be sharing and networking with people who are into the same things as me! Going to take advantage of this system,and thank you for sharing and explaining this to us! What is the difference between a public share and private on Google+? How do I know when I share someone else’s +1 if it’s public or not and does it make a difference? Thanks for sharing your knowledge – I’m lost! Thanks so much for the video! I have a google page, but am still trying to learn the platform.